A Canberra company is bringing high quality healthcare to many more Fijians thanks to a new partnership with our Pacific neighbours. Aspen Medical has entered into a 23-year agreement with the Fijian government to deliver critical medical infrastructure and training at two hospitals in the north-west of Fiji's main island. The company, headquartered in Deakin, has a long history of working in the Pacific, being part of the Regional Assistance Mission to Solomon Islands for 14 years and providing medical services in Papua New Guinea, Vanuatu, Kiribati and now Fiji. Aspen Medical chairman and co-founder Glenn Keys said the project would deliver much needed and worthwhile medical outcomes in Fiji. "To be helping someone that is our neighbour is really exciting," Keys said. 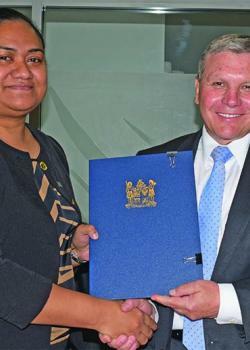 "I'm really impressed with how the Fijian government has approached this. "The 23-year partnership means we will be committed to the long term." Aspen Medical was chosen as the successful bidder by the Fijian government in November, with the contract officially signed on Thursday last week. Keys said the company tailored each of their projects to the specific community and geographical needs of a certain location and could provide anything from staff, equipment, pharmaceuticals, ambulances and even aircraft. "It's a great example of Australian companies taking what we do well and delivering it around the world," Keys said. With Fiji being an immensely popular destination for Australian tourists, Keys said the partnership would also allow tourists to enjoy a Fijian holiday with the knowledge they would have access to quality health care if they needed it. Some of the aspects of the partnership will involve equipping the newly constructed 70-bed hospital in the town of Ba and revamping the 260-bed Lautoka Hospital to increase its output. Aspen Medical will also oversee the installation of new IT and administration systems and enhancing the hospitals' capabilities in a range of specialties including renal dialysis, chemotherapy, oncology, coronary care and maternity services. Keys said the vast majority of staff will be Fijian and Aspen Medical will oversee the training of all staff to ensure there is a common standard across all areas at both hospitals. "We won't just be growing local capacity but local capability as well." Aspen Medical was announced as the National Exporter of the Year for 2018 in November, for delivering medical services around the globe. Outside their work in the Pacific, Aspen Medical operated seven Ebola treatment centres in two African countries during the Ebola epidemic and treated about 48,000 civilian casualties in Iraq, along with other projects globally..